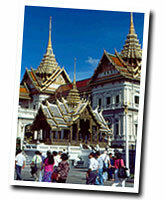 Bangkok is one of Asia most cosmopolitan cities. Created the Thai capital in 1782 by the first monarch of the present Chakri dynasty, Bangkok is a national treasure house and Thailand's spiritual, cultural, political, commercial, educational and diplomatic centre. Major tourism attractions include glittering Buddhist temples, palaces, timeless "Venice of the East" canal and river scenes, classical dance extravaganzas, an almost legendary nightlife, and numerous air-conditioned shopping centres selling Thai silks, cottons, gemstones, bronze and pewterware, and many, many more internationally admired handicrafts. The North of Thailand, formerly the area of the powerful Kingdom of Lana with Chiang Mai as its capital, has long been described as the land of beautiful mountains with colorful changing seasons, and the land of friendly, courteous and graceful people with their dating back to thirteenth century, possess beautiful festivals. Furthermore, there are several hilltribes dwelling on the high mountains. Kanchanaburi is one of the most beautiful provinces of Thailand. 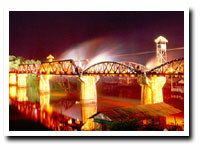 The present provincial capital is a relatively new town built by King Rama II in 1833. It is already well-known as the site of the notorious "Death Railway" and the "Bridge over the River Kwai". 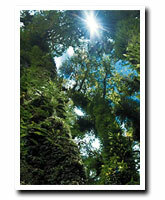 The province also has numerous other places of interest for the nature loving visitor who wants to spend more time here. Pattaya A Travelers Paradise Pattaya is nestled along a picturesque bay on the East Coast of the Gulf of Thailand, roughly 170 kilometers southeast of Bangkok. From a fishing village in the 1960's, Pattaya has emerged as the favorite Southeast Asian vacation center. A fascinating escape where tourists, holiday makers and vacationers from around the world unfold an incomparable array of possibilities to unwind during an exotic holiday beach vacation. Unlike other beach resorts, where natural surroundings are used as magnets to attract tourists, Pattaya makes an all-out attempt to provide the best of everything. Here, everything means everything a tourist can imagine while on holiday: recreation, entertainment, sports, sightseeing and fun. To put it simply, Pattaya is a paradise for everyone, as it has a variety of attractions suitable for all types of visitors. This is the place where you can fill your day, from dusk to dawn, with endless activities, or you may choose to do nothing at all and relax. Samui is one of Thailand's most beautiful islands. Its crystal waters teem with colourful fish, the soft golden sand stretches for miles and the gently swaying palm trees add a tropical touch.